Crystal habit Massive, botryoidal, granular. Crystals uncommon. Solubility Soluble in sulfuric, nitric, and hydrofluoric acids. Uraninite is a uranium-rich, radioactive mineral that is composed mainly of uranium dioxide (UO2). It is black or brownish and the principal ore of uranium. It is most commonly known in the variety pitchblende. This mineral also contains minor amounts of radium and helium, which are the main decay products of uranium. In addition, it is often mixed with UO3 and oxides of lead, thorium, and rare earths. Upon weathering, uraninite may produce attractive uranyl phosphate or uranyl silicate minerals. 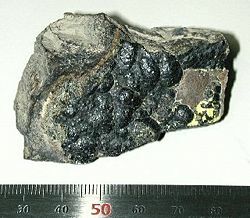 Uraninite is a major ore of uranium. An important occurrence of pitchblende is at Great Bear Lake in the Northwest Territories of Canada, where it is found in large quantities associated with silver. Some of the highest grade uranium occurrences in the world occur in the Athabasca Basin in northern Saskatchewan. It also occurs in Australia, Germany, England, and South Africa, and in New Hampshire, Connecticut, North Carolina, Wyoming, Colorado and New Mexico in the United States. All uraninite minerals contain a small amount of radium as a radioactive decay product of uranium; it was in pitchblende from the Jáchymov (then also known as Joachimsthal) in Czechoslovakia that Marie Curie discovered radium. Uraninite always contains small amounts of the lead isotopes, Pb-206 and Pb-207, the end products of the decay series of the uranium isotopes U-238 and U-235 respectively. Small amounts of helium are also present in uraninite as a result of alpha decay. Helium was first discovered on Earth in uraninite, after previously being discovered spectroscopically in the Sun's atmosphere. The extremely rare element technetium can be found in uraninite in very small quantities (about 0.2 ng/kg), produced by the spontaneous fission of uranium-238. ↑ The name pitchblende is derived from pitch, because of its black color, and blende, a term used by German miners to denote minerals whose weight suggested metal content, but whose exploitation was, at the time they were named, either impossible or not economically feasible. Mineral Gallery. The Mineral Uraninite Amethyst Galleries, 2006. Retrieved September 28, 2007. All links retrieved January 12, 2015. This page was last modified on 12 January 2016, at 15:23.